Your weight for peanuts – well, actually pennies. The Ohio State University Urban Arts Space recently paid homage to a 100 years of American ingenuity and industrial design with an exhibit of penny scales. 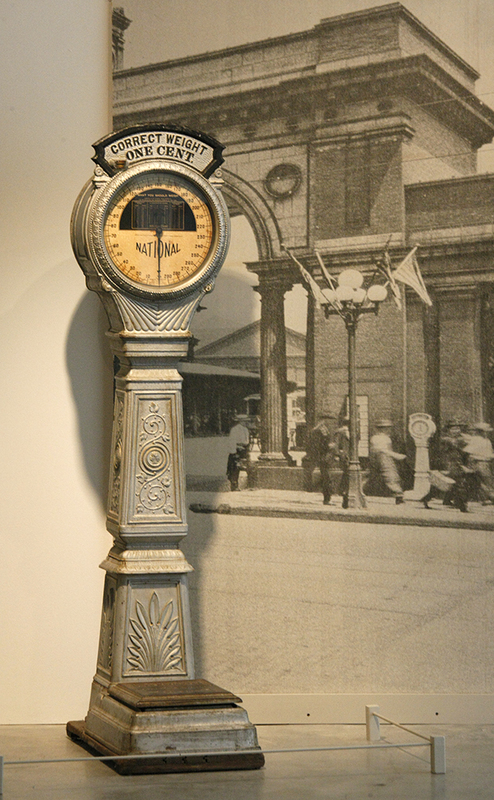 As part of a nationally recognized collection belonging to Christopher K. Steele, the display chronicled penny scales from 1890, through the art deco era, to 1992. A designer of architectural models by trade, Steele has collected almost 200 scales, most of them still in working order, with some of the cast iron work horses being more than a century old. 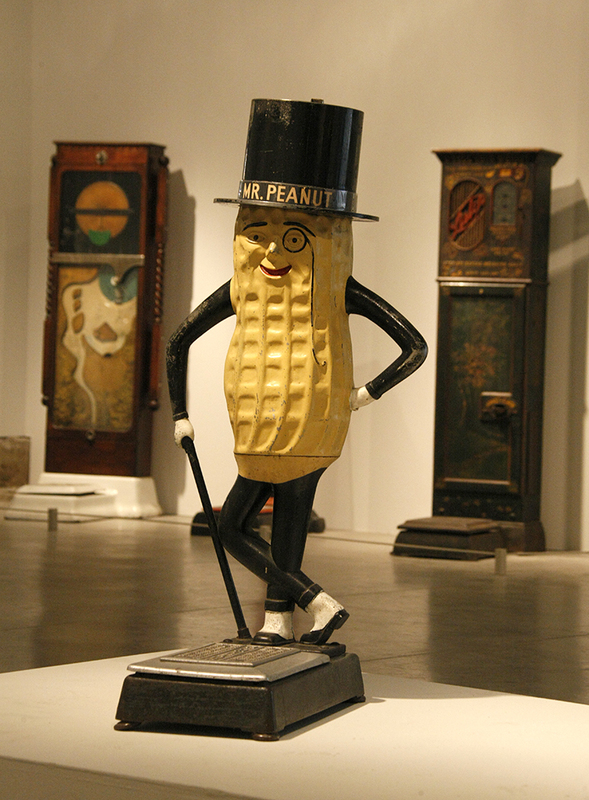 Mr. Peanut, a novelty penny scale standing 4 feet tall, was created in 1951. His is one of only 65 ever made – one for each of Planters Stores. Steele takes pride in preserving both the patina and place of origin of each of his scales, maintaining their original condition in lieu of repainting to disguise years of wear. His prized Mr. Peanut scale has a worn spot on its nose from children rubbing it for good luck. Many of the scales used mirrors to attract attention, hoping to play on people’s vanity and curiosity. But it was something different that caught Steele’s attention, as well as his ear. In an OSU Urban Arts Space podcast, Steele said he honored the voice, having emptied his bank account many times to satisfy his muse. Steele acknowledged, as with all collections, it’s all about the hunt. When asked if there were any white whales awaiting him, he noted that a Buck Rodgers style rocket ship scale and a Humpty Dumpty scale still elude him. First developed in Europe in the late 19th century, coin-operated scales began springing up in the U.S. by the early 1900s, becoming commonplace in pharmacies, stores, train stations and anywhere else a passers-by might be enticed to drop a penny to satisfy their curiosity, said Steele in an interview with Joe Blundo of The Columbus Dispatch. By the 1930s, scales were collecting 10 billion pennies a year nationwide. Like people, the scales came in all shapes and sizes, some shaped like street clocks and some like skyscrapers. Added enticements such as fortune telling and photos of movie stars, lured folks to weight in. With the introduction of the first bathroom scales in the 1940s, popularity of penny scales began to wane. However, Steele would love to see the return of public scales. Through computer technology, he believes they will make a come back, citing the recent presence of scales in Dublin, Ireland, which register weight, blood pressure and BMI (body mass index). And with American obesity rates at an all time high, you have to wonder if a resurgence in public scales would help curb our national appetite. Steele is also founder of the non-profit architectural preservation group, Citizens for a Better Skyline. Since 1983, the group has designed and funded numerous public arts projects, including the nationally recognized Mona Lisa mural in the Columbus Short North District. Read more about the mural at shortnorth.com. Contact Christopher through his web site at The American Weigh. This entry was posted in Art Exhibit Reviews and tagged art review, bathroom scale, Christopher Steele, Citizens for a Better Skyline, OSU Urban Arts Space, penny scale, The American Weigh. Bookmark the permalink. Great pictures. I do indeed hope the collection goes to the Strong National Museum of Play. They would like to enlist it in the fight on childhood obesity. Your superb photographs and descriptions brought Chris’s show to a new level of understanding. I attended the show, but your work really put it in context and understanding. Thanks for the great work. Very cool, Larry. Thanks for sharing. What a different era! Knowing your weight was a novelty.